I guess I’m ready for anything, but my experience at that locale has been limited to concert fare: weenies, soft serve and beer by the can – albeit some of Wachusett Brewing’s finer brews. Assured that they have a new restaurant, Samuel Slater’s, I suspended my disbelief for the trip down Route 395. When we finally found the entrance to Indian Ranch it was a bit spooky to drive by those empty campsites, abandoned now, with last summer’s energy just a specter. But lo!, as we pulled into the VIP parking lot, there it was: a wood-timbered covered bridge all bedazzled in icicle lighting welcoming us to dinner. 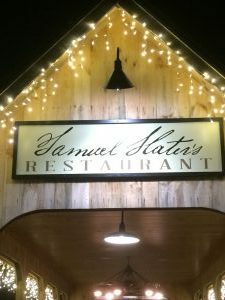 A walkway to the restaurant provides context; country themes and an explanation of their name: Samuel Slater, a Webster resident, “Father of the American Industrial Revolution.” That was news to me, Slater’s Mill was founded in Pawtucket, an anchor of the Blackstone Valley. Slater’s host provided a warm welcome and led us to the dining room, past an open kitchen where prepped seafood was on display and a full bar with plenty of craft brews on tap. The perimeter of the dining room had full-sized glass doors that overlook the lake; in this post-sunset hour all that was visible were the sparkling blue lights of their paddle wheel boat, the Indian Princess. Just one glace through their verdigris-clad menu told me to forget the weenie experience. A sophisticated wine list, craft beer chalk-board, and dinner menu that in scope and culinary appeal rivals any I’ve seen… anywhere… in a long time… led to heightened expectations. Nicole, our server, got things going with a dish of sliced yeasty bread served warm with oil, butter and a half-bulb of roasted garlic. I haven’t seen that garlic treatment in years and miss it! I got right down to shmearing creamy garlic on a slice. Slater’s menu was a challenge: I would have tried everything. In fact, they try to make that a possibility with a Chef’s Tasting Menu; plus, on several nights a Prix Fixe Menu is posted and spec-your-own slates of artisanal cheeses and charcuterie are standard offerings. On this first visit, though, my friend and I decided to stick to the regular menu. When it came to appetizers there were lots of temptations, in particular their Meat Candy, but we shared an order of Scotch Eggs. Scotch Eggs would seem a minefield of risk for most kitchens. After all, the eggs must be soft-poached, carefully peeled and then layered in an even cloak of sausage bits and herbs. Slater’s chef accomplished it perfectly. The crusty coating was evenly browned and, once cut in half, the deep-yellow yolks oozed forth into whole-grain mustard and, for contrast, a sticky-sweet jammy compote of green apple. This item proved emblematic of Slater’s menu: interesting, unusual and scrupulously well-prepared. The crisp flavor and sharp bitter of my craft brew selection, Zero Gravity’s Conehead IPA brewed with citra hops, was an ideal contrast with and between each food course. When it came to entrée selections Nicole could have served me randomly from Slater’s menu and I would have been happy. Left to my own devices, though, I narrowed it down to Duck Duck Goose (crispy duck breast with gooseberry preserves) and Pan Seared Day Boat Cod. I went with the Cod and never looked back. This was flaky, crisp-edged white fish the way I love it; fall-away tender and juicy. It was served with a sautéed-hash of fall vegetables and lobster meat – plenty of claw meat! And all that over creamy carrots pureed with fresh ginger. Each flavor was a delight! In sharp contrast to the delicate flavors of my entrée, across the table was something diametrically opposed. My friend’s entrée, Three Little Pigs, was a study in richness laden with lavish porky flavor: pork and apple smoked sausage, several thick slices of grilled pork loin and a huge cube of maple-braised pork belly. I snagged a sample of each; this was the work of a master and about as subtle as a concert by Charlie Daniels – patron saint of Indian Ranch. Our satisfaction was complete. Some of summer’s highlights have been attending concerts in the Indian Ranch pavilion; they’re always a cultural experience of sorts. Now the trip to the shores of Webster Lake will be a special culinary event any time of year.